India, with its proud ancient civilization and old culture is endowed with the largest number of rock-cut structures in the world. 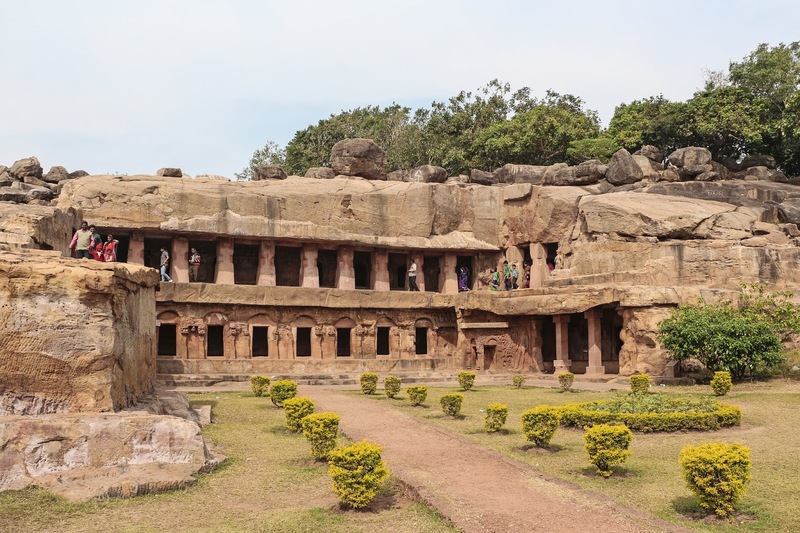 Believe it or not, there are more than 1,200 known rock cut structures across India; a whooping number and each one exhibits some kind of artistic and architectural excellence of global importance. They are mostly Buddhist shrines / monasteries. Many of these exquisite stone carvings. are found in places far away from urban areas in the forested mountain terrain. These wonderful stone-carved rock-cut medieval structures tell you how good and talented our ancient people were in the area of structural engineering, stone carving and craftsmanship centuries ago. Rock-cut architecture is a unique and distinctive practise of creating a structure by carving it out of solid natural rock and it requires certain rock out-cropping that can be carved easily without breaking or chipping and such sites should be at a higher level so that flooding and excessive raining won't affect them. Indian rock-cut architecture is invariably religious in nature. 01. 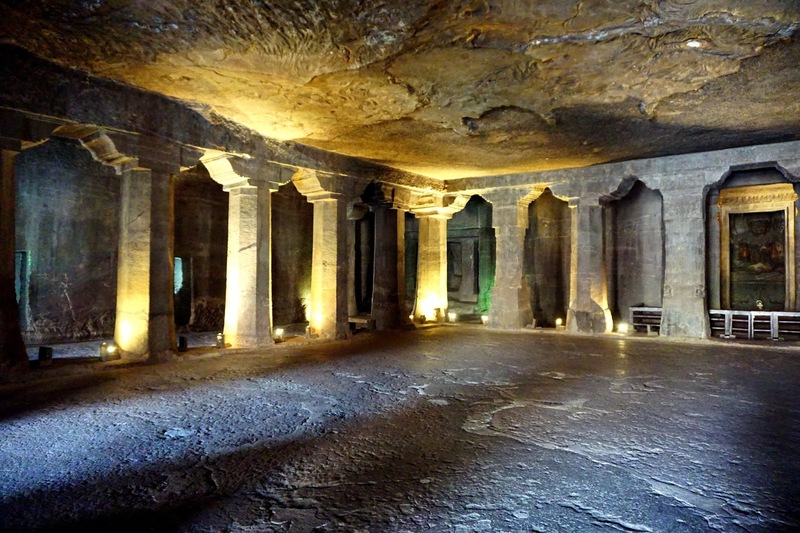 In India, caves have long been regarded as places of sanctity, sacred places to be revered. Regardless of nature, whether they are natural or man made, caves are believed to hold the same sanctity. 02. Ancient humans used the natural caves for the purpose of shelter to reside and keep themselves safe from wild animal attacks. Later when they began to worship nature etc caves became shrines. Some kind of divinity /spirituality was attached to them. Minor alteration of cave took place during the Palaeolithic and Mesolithic periods, up to about 6000 BC. In the fringes of Deccan region, the Rock Shelters of Bhimbetka, a World Heritage Site and grotto, researchers found primitive tools and decorative rock paintings because of massive erosion of sandstone outcrops. 03. From them evolved the free-standing religious structures - Hindu temples, etc. The sanctum or garbagraha is the innermost part of any Hindu temple. Small in size and poorly-lit, it retains the cave like ambiance with the presiding idol in the center. Except through a small hole, at most temples, sunlight does not enter the sanctum. Mostly oil lamps are used inside the srikovil as it is divinity-personified. 04. The Barabar caves form the oldest rock-cut architecture dating back to the 3rd century BC. 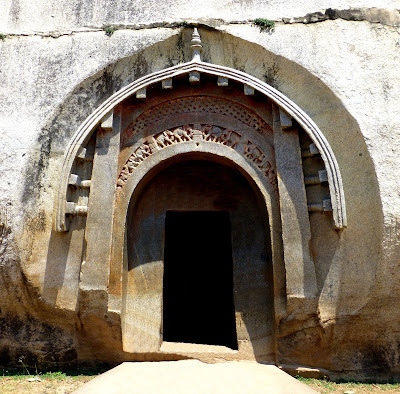 Other early cave temples are found in the Western Deccan region made of Basaltic (volcanic) rock and many of them are Buddhist shrines and monasteries, dating between 100 BC and 170 AD. 05. It is said in the early stages of cave architecture, the cave temples were wooden structures that did not last for a long time. The prominent feature that draws our attention is the shrines are adorned with a wood-like theme in solid rock; Only skilled craftsmen could bring out the look of timber texture, grain, and structure in hard stones. 06. 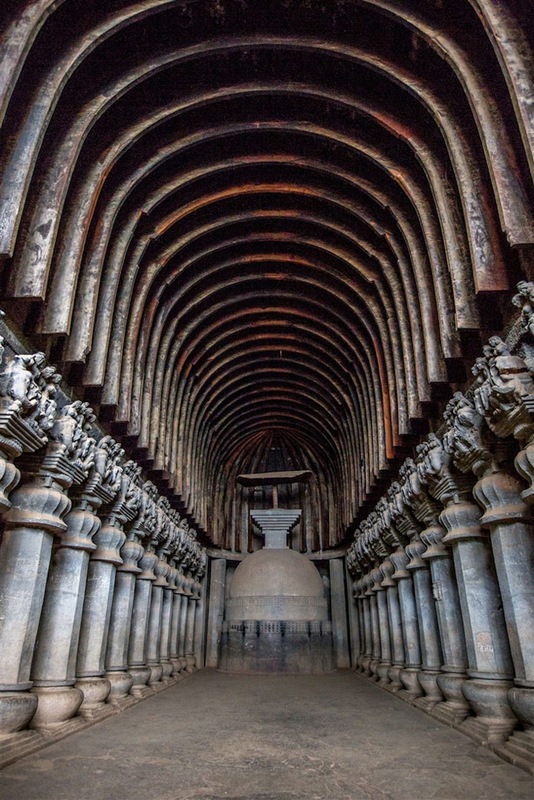 Among the Indian caves temples, the Karla Caves, the Bhaja Caves, the Bedse Caves, the Kanheri Caves, and some of the Ajanta Caves form the earliest ones. 07. What is so important about these caves centuries ago? As found in the relics and inscriptions, these cavestemples had religious as well as commercial connotations, because Buddhist missionaries were on the move from one place to another often accompanied by traders on the busy international trading routes through India. As they lacked lodging facilities, these cave temples in the wooded areas served them well for rest and food. 08. Early rock-cut temples were simple in nature. As time went by more and more wealthy traders and rulers found them useful and donated funds. 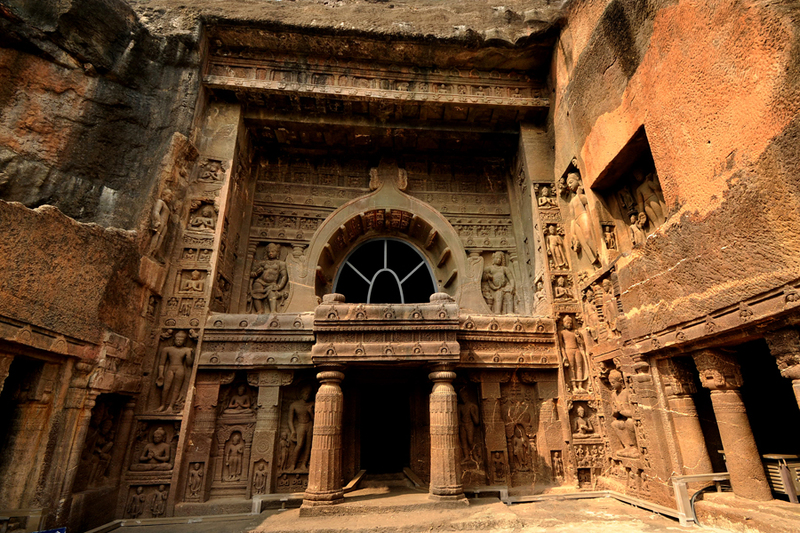 Hence later cave temples had elaborate facade, ornate pillars, etc as they were commissioned by wealthy traders. It shows the prevalence of booming maritime trading in SE Asia. 09. Free standing structural temples came up in the 5th century, however, the interest in rock-cut temples continued unabated. Equally a large number of rock-cut temple were built side by side by the rulers and others. 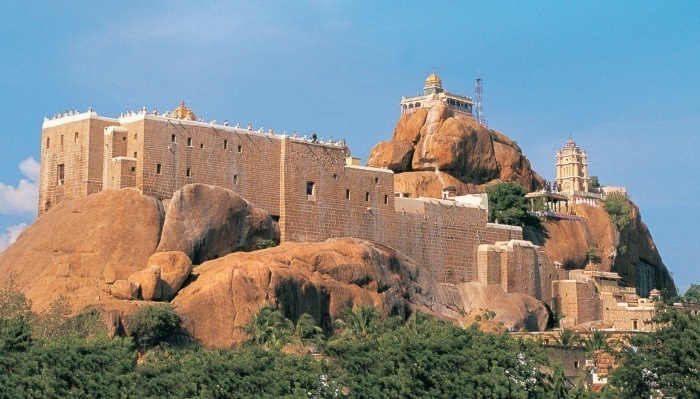 The Tiruchirapalli Rockfort temple dedicated to Lord Ganapati, TN is a good example. Shiva temple dedicated to Thayumana Swami in the Rockfort complex is a typical rock cut temple carved out of the huge outcrop. Pallava rulers built them. 10. One could see more refinement and sophistication in design and architecture in the later rock-cut temples. 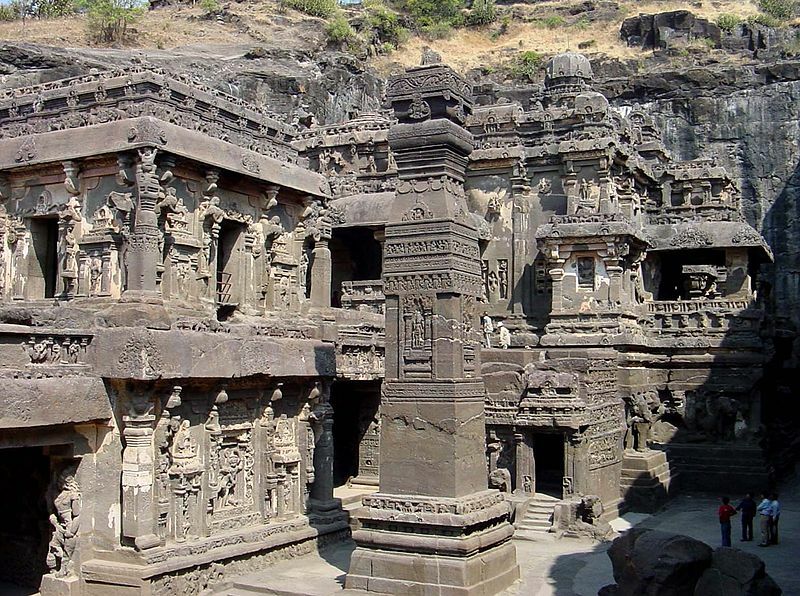 The Ellora Caves is a well made structure. The monolithic Kailash Temple, last excavated rock-cut temple, may baffle our imagination. 12. During the time of the Buddha (c. 563/480 or c. 483/400 BCE) natural caves were widely used by Buddhist monks, ex. the Saptaparni Cave, southwest from Rajgir, Bihar. This site is associated with some parts of Buddha's life. Buddha is believed to have spent much of his time here before his death - paranirvana and the monks held a council here after his demise. 13. The Buddha himself was instrumental in using the caves - natural or man-made as religious retreats for meditation and spiritual experience; he also also used the Indrasala Cave for meditation, Such natural retreats, would last for over a millennium as they are made of tough rocks. Far removed from town and cities, the serene surroundings suited the monks for their religious practices. Since Buddha's time rock-cut temples had become popular. 14. It was in the 3rd century BCE Indian rock-cut architecture began to develop with well-defined and sophisticated designs. Ex: the state-sponsored Barabar caves in Bihar, personally dedicated by Ashoka circa 250 BCE. of Hisua (belonging to the Mayura empire) like Barabar caves, have well polished structures without any inscription, but smaller than the latter. No details are available as there are no inscriptions. 16. 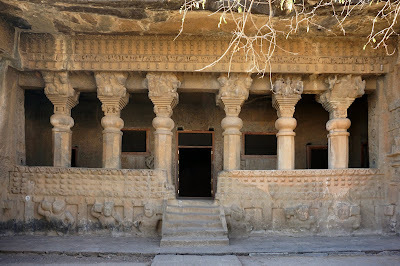 The Jain Son Bhandar Caves in Rajgiri, generally dated to the 2nd-4th centuries CE, are similar to Barabar caves structurally, but the rock polishing was irregular. It is likely they may be older than Barabar caves or of the same period. 17. There occur both natural and artificial caves near the capital city of Bhubaneswar, Odisha called Udayagiri and Khandagiri Caves, situated on two adjacent hills - Udayagiri (meaning sunrise hill) and Khandagiri; the former has 18 caves and the latter 15 caves, There are finely and ornately carved caves built during 2nd century BCE. It is believed. that most of these caves were carved during the reign of King Kharavela and monks used them for residential purpose. 18. In the western India, building of a spate of religious caves picked up and lasted till 6th century CE and it was after the Barabar caves. But unlike them, polishing of stone was not done, this being due to the nature of rocks - mostly Basaltic rocks that are not as rigid as granite is or it could be due to lack of funds. 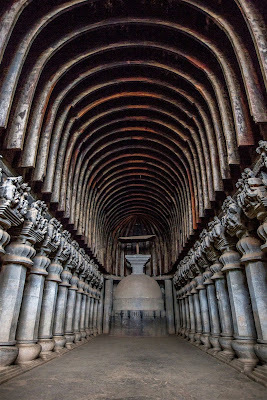 19, The great caves like Karla Caves (1st century CE) or the Ajanta Caves (5th century CE) are devoid of polishing. 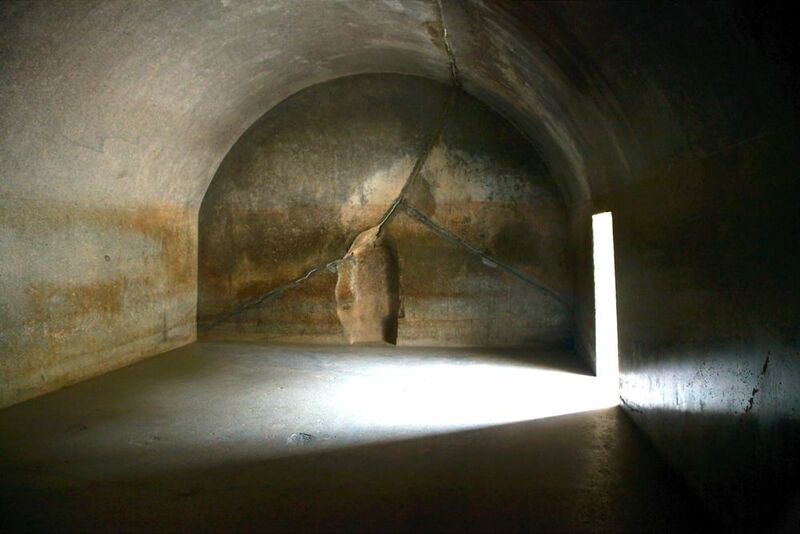 As for Mauryan caves, they were commissioned by the government with funds, but later caves lacked polishing, etc as they were sponsored by the public. This being due to financial crunch. 20. For purely political reasons, efforts to build cave temples shifted to western India. The fall of Mauryan empire (2nd Century BCE) and persecution of Buddhism in the later period- during the reign of Pushyamitra Sunga caused the exodus. 21. Religious building activities (Buddhists or Jain) continued in the Deccan region until the 2nd century CE, culminating with the Karla caves or the Pandavleni caves. 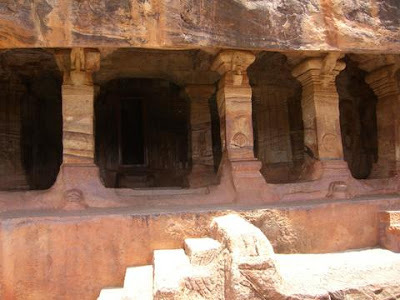 These caves were characteristic of apsidal plan with a stupa in the back for the chaityas, and a rectangular plan with surrounding cells for the viharas. These caves were used for residential as well as for religious purpose.Topography of the Basaltic terrain in the western ghat with flat top suited them well. 22. Excavated in the 1st and 2nd centuries, Kanheri Caves and those at Ajanta were occupied continuously by Buddhist monks from 200 BCE to 650 AD. These caves/monasteries were used by the traders for rest and relaxation while on travel. As more funds were made available for cave building by the prosperous trader and royal patrons the later caves exhibited embellishments and sophistication, etc in terms of artwork, fine carving and decoration. Donors left their inscriptions with their name etc. Greeks -Yavanas made a solid contribution roughly 8% of the contributors. Buddhist ideology gave importance to mercantile trade activities. 23. Facades were added to the exteriors while the interiors were designed for specific uses, such as monasteries (viharas) and worship halls (chaityas). 24. Over a period of time one could see transition in structural designs; caves began to look like free-standing buildings and such structures needed good expertise and skilled persons and craftsmen to complete them, taking into account, foundation, and structural engineering and weight of the overlying structure. The artisans created wood grains, wooden features in rocks, reviving their roots in wooden structure. 25. The Buddhist and Jain cave Basadi, temples and monasteries are quite interesting and many with gavakshas (chandrashalas) are the early examples of rock-cut architecture. The religious leaders taken to asceticism, preferred natural caves, etc away from urban areas. 26. The earliest rock-cut garbagraha -sanctum, similar to free-standing ones, later had an inner circular chamber with pillars to create a circumambulatory path (pradakshina) around the stupa and an outer rectangular hall for the congregation of the devotees. 28. Buddhist caves spanning six centuries beginning in the 2nd or 1st century B.C played a crucial role in those days - a period of intense building activity at this site occurred under the Vakataka king Harisena between 460 and 478. They have a rich variety of decorative sculpture, nice;y carved columns and carved reliefs including exquisitely carved cornices and pilaster- a tough stone work. 29. What surprises the visitors is how beautifully the skilled artisans crafted living rock to imitate timbered wood ex.lintels, grain and intricate decorative carving in construction. Such decorative elements were meant for enhancing the beauty of the ambiance, rather than any other purpose. 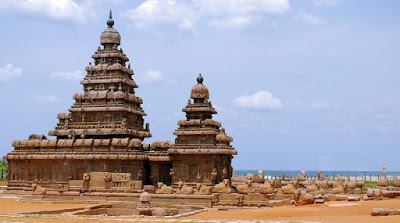 30, In the later periods, the Hindu rulers of South India, impressed by the rock-cut temples of western India, built many cave temples dedicated to Hindu gods and goddesses. A case in point is the Badami Cave Temples at Badami (Karnataka), the early Chalukya's capital, Belonging to the 6th century there are four cave temples (three Hindu temple and one Jain temple) carved out from the sides of cliffs. They exhibit attractive architectural elements such as decorative pillars and brackets and also finely carved sculpture and richly etched ceiling panels. There are are many small Buddhist cave shrines close-by. 31. Rock-cut architecture slowly gave rise to ornamental step wells in India, dating from 200–400 CE.Later, the construction of wells at Dhank (550–625 CE) and stepped ponds at Bhinmal (850–950 CE) took place. 32. The credit goes to the Pallava rulers of south India who dramatically created monolithic copies of structural temples in the south. As for the extension of rock-cut temples down south, the pallavas did not go beyond Arakandanallur, exception being the Tiruchirapalli Rockfort temple complex on the south bank of the Cauvery River. The Rockfort complex has two separate temples dedicated to Ganapati and Shiva; the former is atop the hill. 33. Pancha Rathas is an example of monolith Indian rock cut architecture dating from the late 7th century located at Mamallapuram, a UNESCO World Heritage Site. It is near Chennai city. 36. 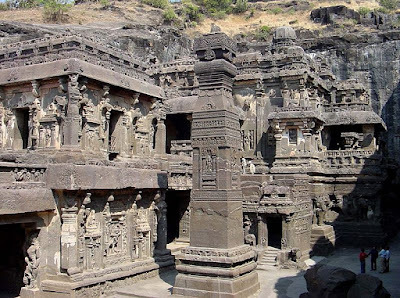 The Kailash Temple, or cave 16 as it is known at Ellora Caves located at Maharashtra on the Deccan Plateau, is a huge monolithic temple dedicated to Lord Shiva. and is equally famous as Ajanta caves are. There are 34 caves built at this site, but the other 33 caves are carved into the Deccan Basaltic terrain. The Kailash Temple was ingeniously created by excavation from top to bottom - 100 feet deep down into the volcanic basaltic cliff rock. Commissioned by ruler Krishna I, it is believed that it took 100 years to finish the work. Amazing Article really happy to say it was an interesting post Information Is Asama. Thanks For Sheering. This Is Pradeep From Mysore One Day Tour Packages . Famous kailash temple in ellora maharashtra.